Discussions about the Western world’s policy on Iran often fail to consider the will of the Iranian people. Events on the ground in Iran must be considered as part of a comprehensive foreign policy. The uprising that began late December 2018 in Iran created shock waves, both within Iran and throughout the world. In 140 cities across Iran, people took to the streets with chants of: “Down to Khamenei!” Down to Rouhani!” “Reformists, hardliners, the game is over!” These protests, which continue today, leave no doubt that the people demand regime change. Iranians want a free republic to replace the oppressive theocracy currently in power. Many people in governments across the West were surprised to find that many of the people who were on the streets protesting for change were the same people that they had previously thought of as the regime’s base of support. Iranians from all walks of life are demanding change. On June 30, 2018, a massive event will be held in Paris. 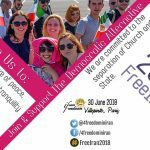 Titled “Free Iran: The Alternative,” this gathering is expected to attract tens of thousands of MEK supporters from all over the world. Each Iranian who attends represents many Iranians inside the country who are protesting for a free Iran. News of the planned event has reached those inside Iran via social media, and people all over the world have sent messages of support. The Free Iran event is meant to be an echo of the protests for freedom that continues inside Iran. MEK supporters gather annually for this event, drawing crowds of 100,000 people in previous years. This year’s event is expected to surpass previous attendance due to the unrest inside the country and because of international events concerning Iran. People are expecting to show up in record numbers to mark the dawn of freedom in Iran and the end of Islamic fundamentalism. During last year’s annual event, Mrs. Maryam Rajavi, President-elect of the National Council of Resistance of Iran (NCRI), of which the MEK (PMOI) is the largest member, said that regime change in Iran is an achievable and necessary goal. Many people (including so-called “experts” on Iran) who heard her message were skeptical at the time, but the recent uprising has proved her to be correct. This year her message will be direct and simple: there is a democratic alternative to the oppressive regime in Iran. The will of the Iranian people has been ignored and put aside for too many years. The narrow lens of the West failed to account for the reality that the mullahs’ regime requires suppression of its people and the export of terrorism to continue its existence. Appeasement of the ruling regime only serves to embolden the mullahs in their warmongering and fundamentalism. The only way to avoid more war and unrest in the region is to replace the religious dictatorship in Iran and replace it with a secular democracy. The Iranian people have demanded a free Iran. It is time to heed their cries for freedom and look at the alternative to the oppressive theocracy currently in place. A free Iran is a democratic Iran which honors the rule of law. A free Iran is one in which women are treated as equals to men and are represented in the country’s political leadership. 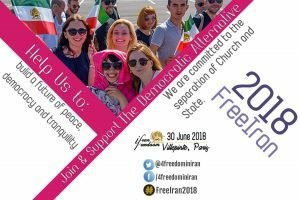 A free Iran is one in which people of all races, ethnicities, and religion can live and work together in peace to build a new Iran on the ashes of the mullahs’ regime. The Free Iran event is also unique its lack of partisanship. In this era of polarization and division, people from all over the political spectrum will gather together to support the Iranian people’s goal of freedom and democracy through regime change. Dignitaries, politicians, and lawmakers of rival political parties are joined in their support of a free Iran. Among those addressing the rally will be Americans and Europeans, Democrats and Republicans, Conservatives and Christian Democrats as well as Social Democrats and Socialists, as well as Iranians representing their communities inside Iran. Iranians attending the rally come from different social classes, different educational levels, and different political affiliations, but they will be united in their shared goal of a free Iran and in the bond that connects them with the millions inside Iran working toward the same goal. The unity of the opposition is strong and can lead the country to regime change. Ali Khamenei, the regime’s Supreme Leader has already acknowledged the role of the MEK in organizing the uprising in Iran. Regime President Hassan Rouhani even went so far as to demand that French President Emmanuel Macron take action against MEK members in France, a request that Macron denied. The regime is afraid that the MEK has the power to lead the people to a democratic Iran. Last year’s rally was attended by over 500 dignitaries from the international community and included former prime ministers, government officials, and Members of Parliament. European attendees included Bernard Kouchner, former French Minister of Foreign Affairs; Rita Suessmuth, former President of Germany’s Bundestag; and the former U.K. Minister of Northern Ireland. American dignitaries included Ambassador John Bolton, Senator Joe Lieberman, former New York City Mayor Rudy Giuliani, Governor Ed Rendell, and former U.S. House Speaker Newt Gingrich. 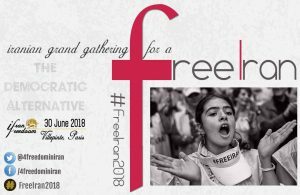 The “Free Iran: The Alternative” event will take place in Paris on June 30, 2018 ,and will present the alternative to religious dictatorship in Iran. Freedom is within the reach of the Iranian people.